St. Nectan is one of the most celebrated saints in the West of England, although details from his life-story are rather sparse. He is chief amongst the Cornish list of children of King Brychan Brycheiniog, usually said to have been the eldest. Nectan sailed south from Wales and landed on the Corno-Devon border at Hartland Point. He found a beautiful valley there, at Stoke St. Nectan near Hartland, with a never-failing spring. He built a little church and a hermitage, forty paces away next to a spring (now called St. Nectan's Well), and lived there many years. He also had a small retreat at the head of St. Nectan's Kieve (or Tub - the hollow at the foot of a waterfall) at Trethevey. It is said that the Knights of the Round Table gathered there to consult with him before setting out on their quest to find the Holy Grail. 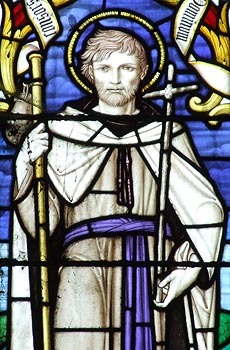 St. Nectan tended to the needs of the poor throughout Devon, Cornwall and even on a trip to Brittany, where churches dedicated to him may be found. He once helped a swineherd find his lost pigs and, in return, was given two cows who provided his daily comestible needs. Most of Nectan's siblings followed him from Wales and were instrumental in evangelising the south-west. They saw Nectan as their leader and gathered every New Year's Eve at Stoke to talk with him. Eventually, Nectan's two cows were stolen by bandits. He tracked them to New Stoke, took them back and tried to convert his persecutors to Christianity. For all his hard work, they struck off his head! Legend says Nectan picked up the severed object and returned, with it, to his chapel at Stoke; and wherever drops of his blood fell, foxgloves sprang up. This occurred on 17th June AD 510. His body was translated to a more fitting shrine in the 1030s and later looked after by the Austin Canons who built an Abbey nearby. Little historical credit is given to the Cornish lists of the children of Brychan and many scholars believe they only indicate that the named persons originated in South Wales. Nectan's name is Pictish and some think he has been confused with Noethon ap Gildas who is known to have come from the North. Prof. Charles Thomas, meanwhile, believes that Nectan is, in fact, a corruption of the name Brychan: father and son being one and the same. He identifies Lundy Island as Brychan's mysterious burial place, Ynys Brychan, from where his body was removed to Stoke in the 7th century.